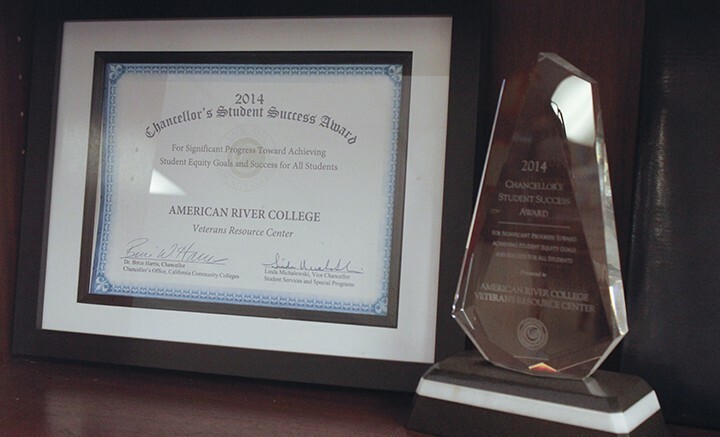 The 2014 Chancellor's Student Success Award is displayed in the American River College Veterans Resource Center, which serves one of the largest communities of community college student veterans in the state (Photo by John Ferrannini). With Veterans Day approaching, it’s time for students, staff and faculty to be reminded that American River College’s large veteran community exists, and has made a home at our college due to the many services that the Veterans Resource Center (VRC) provides to them. As recently as the spring of 2014, ARC had more than 1,300 students who are veterans. While not all of them are actively using the VRC for help, Daniel Avegalio, who works at the VRC, estimated that over 800 actively do. The VRC, which was recognized in 2014 at a statewide community college event for the role it plays in student veterans lives on campus, is modeled to be a one-stop-shop for veterans who are readjusting to civilian life. Applying for financial aid, seeing counselors and all of the other typical worries of students are added upon for veterans, who have to deal with the United States Department of Veteran’s Affairs, a program that does not have a reputation for concise and prompt service to veterans. Instead of dealing with all of these hurdles, veterans can go to the VRC and take care of everything they need done in one place. This encourages success as students, and keeps veterans who are having a tough time transitioning from their military lives from dropping out because of the many frustrations that can arise. Veterans who come out of active duty often go to college as a way to support themselves and their families by means of the GI Bill, but have not attended classes since high school or any college before they enlisted. In most cases, they treat college like they treated their military careers: seriously, and devotedly. That is something a lot of other students could learn from. While “support our troops” is a popular notion, there is an avenue that non-veterans at ARC can take to go the extra mile, by joining ARC’s veterans club as a way to pitch in. The club brings veterans on campus together, and also finds resources for them in the area, both of which could be helped by volunteers. The ARC Association of Student Veterans offers a community to veterans who may not be comfortable talking and befriending just anyone by having events to bring the community together. Non-veterans can also support veterans by being more courteous. Veterans deserve our respect, and also deserve to be treated like regular people, which they are. It is important for us to understand what veterans feel and what they have been through. This understanding comes through asking questions, which is fine and should be encouraged. But questions should be asked sensitively and appropriately, with an eye toward the fact that veterans are human beings too. Think about your worst memory. Imagine that memory being a defining moment of an entire period of your life. And imagine being asked about that memory every single time you tell someone about that period of your life. This is the world that veterans live in, and non-veterans at ARC would be wise to remember that. Recognize that these men and women are coming from a world of rigidity, formality and respect for authority, and entering a college environment that offers very little of what they’ve grown accustomed to. And don’t blame all of their behavior on PTSD, post-traumatic stress disorder. College is a frustrating time, and we’re all prone to anger, confusion and stress. Be the first to comment on "Editorial: Saluting the Veterans Center"